January 26 game between Lee Sedol 9P and Gu Li 9P — the first of their jubango (Lee Sedol Off and Running as MLily Jubango Begins with Gu Li, 1/26 EJ) — was transcribed from the Baduk TV live stream and includes variations and comments by commentators Jo Hanseung 9P and Park Jeongsang 9P. Kuksu Games Available: The game records from the recent Kuksu Cup are now available; four uncommented sgf files have been added to our January 16 report (Cho Hanseung Wins 3rd Consecutive Kuksu 1/16 EJ). Boston defeated Los Angeles (2-1), Greater Washington beat Toronto (3-0), and Canwa Vancouver 1 defeated Seattle 1 (2-1). In B League, Chicago beat Washington DC 1 (3-0), NC Raleigh defeated Washington DC 2 (2-1), and New York City defeated San Francisco 1 (3-0). In C League, Seattle 2 won over West Tennessee/Memphis (2-1), Canwa Vancouver 2 defeated Katy TX 2 (3-0), Brentwood/Nashville def Lincoln (2-1) and Central New York/Syracuse vs Katy TX 1 is in progress, currently 1-1. Check the Pandanet site for all the most up to date information. Here’s the game record for the Evan Cho (LA) vs Huiren Yang (Boston) game. Tony Buzan, the inventor of mind-mapping and author of numerous books on enhancing the power of the brain, has made his debut appearance at a go tournament at the age of 71. The man once named by Forbes Magazine alongside Henry Kissinger, Margaret Thatcher and Michail Gorbachev as one of the world’s top five international lecturers played in round one of the annual Maidenhead Go Tournament, held January 18 at Hitachi’s European Headquarters in Maidenhead, south-east England, after seeing publicity about the tourney in his local newspaper, the Maidenhead Advertiser. It appears that Buzan has long wanted to find the time to learn to play go well, though it is hardly surprising, with his prodigious output and many speaking and other commitments, that he has not so far been able to put in the many hours required to master the game. British Go Association VP Tony Atkins says Buzan approached the Association some twenty years ago, enquiring about learning at the time when manytime British and European Champion Matthew Macfadyen 6d was actively teaching. He added, “I still have fond memories of a festival of the brain that [Buzan] organized at the Royal Albert Hall some years ago, which we were privileged to teach go at”. Atkins organizes the go competition in the Mind Sports Olympiad (see Taylor Wins Gold at London’s Mind Sports Olympiad, EJ 8/28/13), which Buzan co-founded. However, the novice promised tournament organizer Iain Attwell that he will be attending some of Maidenhead Go Club‘s Friday evening meets in the future. If he does, he will be in good hands: the club and tournament, sponsored by Hitachi, grew out of the Furze Platt School go club which Attwell founded some twenty-five years ago with fellow teacher France Ellul who had taught him to play, and the school produced every single Under-16 and Under-18 British Youth Champion for a number of years. 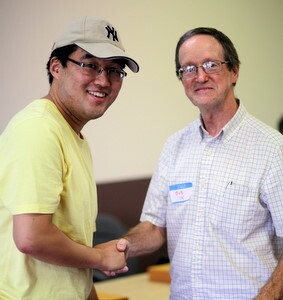 Attwell described his guest as “a very nice gentleman”, and expressed hopes that Buzan will be as good as his word. In a surprise finish, Toby Manning 2d of Leicester this year stole the tournament from British Championship Challenger Andrew Simons 4d of Cambridge in the third and final round. Click here for full results. Report by Tony Collman, British correspondent for the E-Journal; photo courtesy of Buzan’s mindmappingsoftware blog. Ireland: The first half of the Irish Championship League finished on January 19 in Dublin with Roman Pszonka 3d in first, James Hutchinson 1d in second, and Tiberiu Gociu 3k in third. Russia: Also on January 19, the Russian Youth Championship finished in Moscow. Grigorij Fionin 4d won the under 16 division with Dmitrij Miljutkin 4d in second and Anton Chernykh 4d in third. Kim Shakhov 1k took the under 12 tournament while Andrej Mramorov 3k placed second and Mikhail Dobricyn 4k came in third. Romania: Adrian Nedan 2k (left) bested Elian Ioan Grigoriu 1d at the MPRB 5.2 Braila on January 19. Iulian Toma 3d was third. NOTE (1/29): this report has been updated to reflect that only the first half of the Irish Championship League finished on January 19, not the entire league. 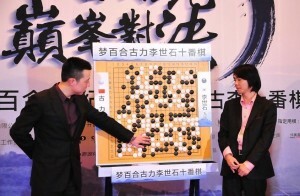 Though both players shocked fans and each other with many unexpected moves, Lee Sedol 9p defeated rival Gu Li 9p in the first game of their jubango, or ten-game series, on January 26 in Beijing. Cheering on Lee were his wife and daughter while Gu was backed by his former teacher, legendary instructor Nie Weiping 9p. Younggil and others provided live commentary during the game but Younggil is also working on written commentary for those who may have missed it. For more information on the MLily Gu vs Lee jubango including photos, analysis, and continuous updates, please visit Go Game Guru. 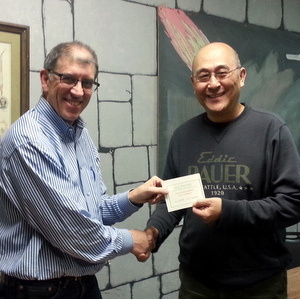 John Zhang 4D, Peter Enyeart 3k and Damon Hoffman 17k all went 4-0 to top the Austin “Dead of Winter” Go Tournament on January 25 at local game store Great Hall Games in Austin, TX. “This was the first of what is planned to be quarterly tournaments throughout 2014,” said tournament director Bart Jacob. He added that although “the unusually cold and icy weather limited the number of out-of-town players this time, we hope and expect future tournaments will draw players from Dallas, Houston, San Antonio and beyond.” On a side note, Jacob also said that “The rumored participation of Lee Seedol 9P and Gu Li 9P was proved incorrect as apparently they could not reschedule their commitment to their first game of their jubango match.” photo: Bart Jacob (left) with John Zhang. In addition to the Irvington and Richmond programs, Freedman reports that several other schools are picking up the model. The Grant High School chess club morphed into a chess and go club this year, with about 12 students. 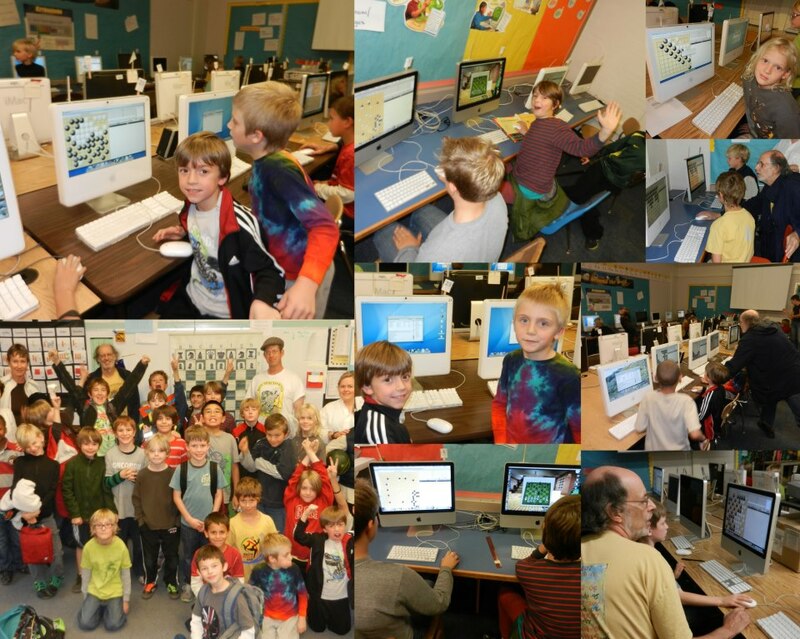 Beverly Cleary elementary school did as well, with Freedman teaching go and long time chess coach Brad Kerstetter continuing his work. Freedman also envisions that his model should be economically sustainable, is actively pursuing this: “At Irvington and Richmond we charge $75/term, or $150 for the year, per child, for a one hour/week club meeting. In Irvington, Beverly Clearly, and Richmond we divide the group in two. For the first month half of the kids play go, half play chess. The second month, they switch. After that they choose: chess only, go only, or, chess and go. If they choose chess and go, they play one game for 4 weeks, and then switch each four weeks until the end of school,” reports Freedman. “Needless to say, the starter kits and technical support we get from the AGF are an important part of our success,” notes Freedman, “we order and pay shipping for a Hikaru no Go manga set at each school where we teach as well.” Freedman and Balwitz have put together curriculum guides and outlines for their method, which can be downloaded on the AGA Teaching Page. 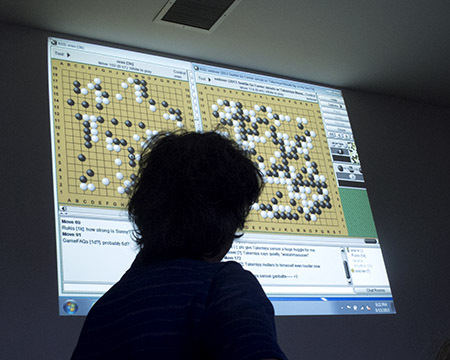 Free equipment, Hikaru no Go, and other resources are available on the AGF website. -Paul Barchilon, E-J Youth Editor. Photo from the Irvington Elementary School Yearbook (click on image to view it at full size). The highly anticipated first game of the 10-game series (jubango) with $860,000 in prize money between Lee Sedol and Gu Li will be held in China on Sunday, Jan. 26 (Lee Sedol-Gu Li Jubango to be Broadcast Live on KGS 1/20 EJ). Thanks to the international date line, this game will start on Saturday evening, Jan. 25 in the U.S. The game will be broadcast by KGS starting at 8:30 pm EST, and 5:30 pm PST. The commentary by Myungwan Kim and others will start at 10 pm EST and 7 pm PST. Eight of Europe’s top players will battle it out online starting this Thursday in the 1st WBaduk European Top 8 Champions League. Organized by the European Go Federation and WBaduk, the 7-round round robin tournament has a 3,000-euro prize pool, with 1,000 euros to the winner. The players are Hui Fan 2P (France), Ilya Shikshin 7D (Russia), Catalin Taranu 5P (Romania), Alexander Dinerchtein 3P (Russia), Antti Tormanen 7D (Finland), Pavol Lisy 6D (Slovakia), Artem Kachanovski 7D (Ukraine) and Csaba Mero 6D (Hungary). Rounds will be played on the Wbaduk server every Thursday and Monday at 19:30 (1:30p EST) Central European Time from January 23 through February 13.